SYNTHETIC DREADS - #613 BLEACH BLONDE. They are pencil thickness and are fairly light. ELYSEE STAR. Why not add a flash of colour to your hair with ease! They can easily be braided in or removed. Elysee Star are London’s largest wig and hair accessory distributor. Black & Purple double ended synthetic dreads. You will receive 20 double ended dreads. 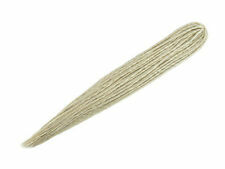 Length: laid out flat end to end they are approx. SYNTHETIC DREADS - #24 NATURAL BLONDE. They are pencil thickness and are fairly light. ELYSEE STAR. Why not add a flash of colour to your hair with ease! They can easily be braided in or removed. Elysee Star are London’s largest wig and hair accessory distributor. 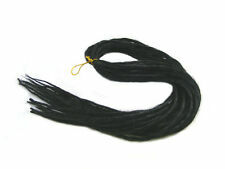 SYNTHETIC DREADS - BLACK. They are pencil thickness and are fairly light. ELYSEE STAR. Why not add a flash of colour to your hair with ease! They can easily be braided in or removed. Elysee Star are London’s largest wig and hair accessory distributor. They are pencil thickness and are fairly light. ELYSEE STAR. Why not add a flash of colour to your hair with ease! They can easily be braided in or removed. Elysee Star are London’s largest wig and hair accessory distributor. SYNTHETIC DREADS - PEACH. They are pencil thickness and are fairly light. ELYSEE STAR. Why not add a flash of colour to your hair with ease! They can easily be braided in or removed. Elysee Star are London’s largest wig and hair accessory distributor. SYNTHETIC DREADS - LIGHT PINK. They are pencil thickness and are fairly light. ELYSEE STAR. Why not add a flash of colour to your hair with ease! They can easily be braided in or removed. Elysee Star are London’s largest wig and hair accessory distributor. SYNTHETIC DREADS - SNOW WHITE & FUCHSIA PURPLE WITH PURPLE SPIRAL. They are pencil thickness and are fairly light. ELYSEE STAR. Why not add a flash of colour to your hair with ease! They can easily be braided in or removed. SYNTHETIC DREADS - RED. They are pencil thickness and are fairly light. ELYSEE STAR. Why not add a flash of colour to your hair with ease! They can easily be braided in or removed. Elysee Star are London’s largest wig and hair accessory distributor. SYNTHETIC DREADS - #12 LIGHT GOLDEN BROWN. They are pencil thickness and are fairly light. ELYSEE STAR. Why not add a flash of colour to your hair with ease! They can easily be braided in or removed. SYNTHETIC DREADS - #4 DARK BROWN. They are pencil thickness and are fairly light. ELYSEE STAR. Why not add a flash of colour to your hair with ease! They can easily be braided in or removed. Elysee Star are London’s largest wig and hair accessory distributor. SYNTHETIC DREADS - #30 REDDISH BROWN. They are pencil thickness and are fairly light. ELYSEE STAR. Why not add a flash of colour to your hair with ease! They can easily be braided in or removed. Elysee Star are London’s largest wig and hair accessory distributor. SYNTHETIC DREADS - #60 SILVER BLONDE. They are pencil thickness and are fairly light. ELYSEE STAR. Why not add a flash of colour to your hair with ease! They can easily be braided in or removed. Elysee Star are London’s largest wig and hair accessory distributor. SYNTHETIC DREADS - GOLD. They are pencil thickness and are fairly light. ELYSEE STAR. Why not add a flash of colour to your hair with ease! They can easily be braided in or removed. Elysee Star are London’s largest wig and hair accessory distributor. 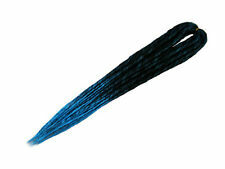 SYNTHETIC DREADS - DARK BLUE. They are pencil thickness and are fairly light. Add a flash of colour to your hair! They can easily be braided in or removed. 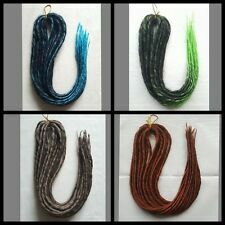 SYNTHETIC DREADS- RED - They are pencil sickness and are fairly light. Add a flash of colour to your hair! I can easily be braided in or removed. Two packets. Synthetic dreads - # 1B Off Black. They are pencil thickness and are fairly light. ÉLYSÉE STAR. They can easily be braided in or removed. Élysée Star are London’s largest wIg and hair accessory distributor. 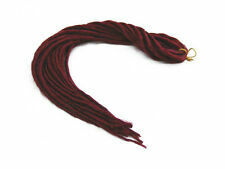 Red Dreadlocks Double Ended Synthetic Singular Dread Fall Extensions. When applied gives 20 dreads. These dreads can be braided into the hair. as dreads can get a little ratty from wearing. You may use steam to re-seal and re-tighten your dreads. White/Pink Tipped Dreadlocks Double Ended Synthetic Singular Dread Fall Extensions. When applied gives 20 dreads. These dreads can be braided into the hair. as dreads can get a little ratty from wearing. SYNTHETIC DREADS - SNOW WHITE. They are pencil thickness and are fairly light. ELYSEE STAR. Why not add a flash of colour to your hair with ease! They can easily be braided in or removed. Elysee Star are London’s largest wig and hair accessory distributor. SYNTHETIC DREADS - #29 LIGHT BURGUNDY. They are pencil thickness and are fairly light. ELYSEE STAR. Why not add a flash of colour to your hair with ease! They can easily be braided in or removed. Elysee Star are London’s largest wig and hair accessory distributor. SYNTHETIC DREADS - DARK PURPLE. They are pencil thickness and are fairly light. ELYSEE STAR. Why not add a flash of colour to your hair with ease! They can easily be braided in or removed. Elysee Star are London’s largest wig and hair accessory distributor. SYNTHETIC DREADS - #39 BURGUNDY. They are pencil thickness and are fairly light. ELYSEE STAR. Why not add a flash of colour to your hair with ease! They can easily be braided in or removed. Elysee Star are London’s largest wig and hair accessory distributor. Pink Dreadlocks Double Ended Synthetic Singular Dread Fall Extensions. When applied gives 20 dreads. These dreads can be braided into the hair. as dreads can get a little ratty from wearing. You may use steam to re-seal and re-tighten your dreads. SYNTHETIC DREADS - #10 LIGHTER BROWN. They are pencil thickness and are fairly light. ELYSEE STAR. Why not add a flash of colour to your hair with ease! They can easily be braided in or removed. Elysee Star are London’s largest wig and hair accessory distributor. SYNTHETIC DREADS - #6 ASH BROWN. They are pencil thickness and are fairly light. ELYSEE STAR. Why not add a flash of colour to your hair with ease! They can easily be braided in or removed. Elysee Star are London’s largest wig and hair accessory distributor. SYNTHETIC DREADS - #1B OFF BLACK. They are pencil thickness and are fairly light. ELYSEE STAR. Why not add a flash of colour to your hair with ease! They can easily be braided in or removed. Elysee Star are London’s largest wig and hair accessory distributor. 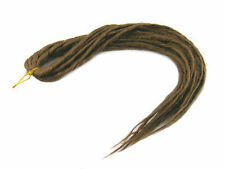 SYNTHETIC DREADS - #18 DARK GOLDEN BROWN. They are pencil thickness and are fairly light. ELYSEE STAR. Why not add a flash of colour to your hair with ease! They can easily be braided in or removed. SYNTHETIC DREADS - BLUE. They are pencil thickness and are fairly light. ELYSEE STAR. Why not add a flash of colour to your hair with ease! They can easily be braided in or removed. Elysee Star are London’s largest wig and hair accessory distributor. SYNTHETIC DREADS - LIGHT GREEN. They are pencil thickness and are fairly light. ELYSEE STAR. Why not add a flash of colour to your hair with ease! They can easily be braided in or removed. Elysee Star are London’s largest wig and hair accessory distributor. SYNTHETIC DREADS - #2 DARKEST BROWN. They are pencil thickness and are fairly light. ELYSEE STAR. Why not add a flash of colour to your hair with ease! They can easily be braided in or removed. Elysee Star are London’s largest wig and hair accessory distributor. SYNTHETIC DREADS - #33 DARK AUBURN. They are pencil thickness and are fairly light. ELYSEE STAR. Why not add a flash of colour to your hair with ease! They can easily be braided in or removed. Elysee Star are London’s largest wig and hair accessory distributor. 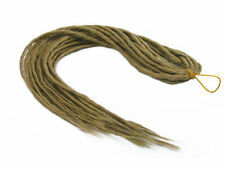 Dreadlocks Double Ended Synthetic Singular Dread Fall Extensions. Col: Light Golden Brown (Col 12). Mounted with elastic to make falls.